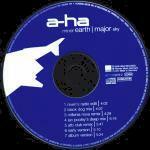 The second single from a-ha's latest album "Minor Earth Major Sky" was sent out to many European radio stations around 5th June 2000 and was released to the shops in Norway and Germany on 10th July. The cover shows a bright blue sky with the top of a house and trees disappearing off the bottom of the sleeve. a-ha and the title are printed towards the top of the sleeve in a large white font. The reverse of the sleeve also shows a blue sky, with the end of an areoplane wing on the left hand side. The track list and production details are listed in white down the centre. The actual disc is royal blue in colour with a white silhouette of the aeroplane wing on the left hand side. 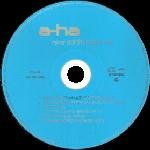 a-ha and the title are printed in white letters at the top of the disc, while the track listing is printed at the bottom. Additional white text is printed on the right hand side and around the circumference of the disc. A slightly different packaged CD was available in Germany (perhaps a second pressing?) which has a similar sleeve to the first, but with the additional text "Incl. Remixes by Ian Pooley, ATB and others" below the title on the front. There are also differences on the reverse of the sleeve, the additional text "the official a-ha website: www.a-ha.com" has been printed below the track information and the catalogue number is in the top right hand corner rather than the bottom right. The discs appear to be the same. In Germany, there was also a limited edition CD-single release which includes an enhanced track - the video for "Summer Moved On". It states that the enhanced track is in "Quick Time" format, but it is actually an MPEG file. This file will, however, play on latest versions of the QuickTime player. The cover of the limited edition CD-single is similar to the `second' regular version mentioned above, but in the top right hand section of the front sleeve is a white rectangle with the text "limited edition incl. VIDEO »summer moved on« 8573 84124-2". The reverse of the sleeve includes additional details of the bonus track "summer moved on (Quick Time Movie // CD-Rom)", designed by Inventive Media ANS. Apart from the extra track listed on the disc, it is otherwise much the same as the disc of the regular release. There was a German 12" vinyl released. It features four tracks, two of which are not found on the CD-single: "Ian Pooley's Toothache Mix" (6:59) which has additional production and remix by Ian Pooley and "Pumpin' Dolls Club Mix" (8:08) with additional production and remix by Juan Belmonte & Abel Arana at Fullhouse Studios, Madrid. The cover of the 12" is similar to the CD sleeve (front and reverse) but with the additional text "Incl. Remixes by Ian Pooley, ATB & Pumpin' Dolls" under the title on the front and the obvious differences in track listings on the reverse. The disc comes with picture labels. The label on side 1, the "earth | side", is similar to the front cover of the sleeve. The track listing is printed over the picture, above the `house top' and "earth | side" printed above the centre on the right hand side. On side 2, the "Sky | side" is the aeroplane wing found on the reverse of the sleeve. The titles are printed over the picture in a similar fashion to side 1, but there is additional production information at the bottom. Note that this 12" plays at 33rpm. There is a UK promo 12" which has the same tracks as the German regular release. No further details. There is a 7 track German acetate promo CD which comes in a slim line case with paper insert. a-ha, the title, promotion use only, not for sale are printed in black on the front and track list and copyright info in black on the back. The tracks are the same as on the regular release. The disc in plain without any text, just the catalogue matrix number etched in the center. Israel: A CD single, similar to the second German pressing, was used for promotion in Israel. It features a promotional sticker on the front sleeve. Japan: There is a rare six track promo only sampler CD which includes the radio mix and album versions of "Minor Earth Major Sky" plus "Take On Me", "The Sun Always Shines On TV", "Stay On These Roads" and "Summer Moved On" (Radio Edit). The sleeve is white with a studio picture of a-ha on the right hand side. On the left side is the CD track listing in black letters. The reverse of the sleeve uses similar colours to the album: light blue and beige with black Japanese text and a small picture of the album. The disc is light blue with silver text. Spain: The regular release of "Minor Earth | Major Sky" is different to that released in Germany. It is German made, but includes eight tracks - all those found on the regular German release except for the album version and the two additional tracks "Pumpin' Dolls Radio Friendly Edit" (3:55) and "Pumpin' Dolls Club Mix" (8:08), both of which have additional production and remix by Juan Belmonte and Abel Arana at Fullhouse Studios, Madrid. The latter of the two tracks is the same mix as that found on the German 12". The ordering of the tracks differs considerably from the German release. Apart from the obvious difference in the track listings, the Spanish release has additional text about the sleeve design printed on the inside of the sleeve plus the text below the title on the front reads "Incl. Remixes by Ian Pooly, ATB & Pumpin' Dolls". There was a promo CD-single release of "Minor Earth | Major Sky" in Spain. It comes in a PVC sleeve, without a cover. The disc is royal blue in colour with a large silver a-ha logo at the top and other silver titles below plus around the circumference of the disc. This promo features two versions of the song: "Niven's Radio Edit" (4:02) and "Album Version" (5:24). Sweden: There was a German made two track CD of "Minor Earth | Major Sky" released in Sweden. It comes in a wallet style card sleeve. The cover is similar to the regular release, but doesn't include the text "Incl.Remixes by Ian Pooley, ATB and others." on the front sleeve. The disc is also similar to the regular release, but instead of the aeroplane wing and text being printed in white, they are silver.